A Smithsonian Book. 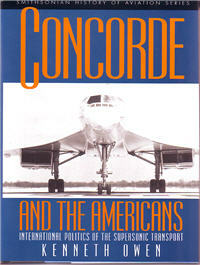 Drawing on recently released documents from business and government archives on both sides of the Atlantic, Kenneth Owen recounts for the first time the dramatic transatlantic negotiations that accompanied the rise and fall of the planned American SST, the unprecedented Anglo-French collaboration in building the Concorde, and the bitter battle for approval of Concorde service to the United States. He discloses that Britain turned to France as a partner in its SST program only after the U.S. government declined to participate. 232 pgs, HB, 6.25ï¿½ x 9.25ï¿½, photos.